Happy Fall…the air is getting crisp; the leaves are changing colors and the sky is blue! Be sure your kitty has plenty of access to see the outside world! Cats enjoy bird watching and leaf bounce too. 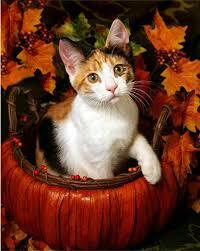 Spend some time cuddling with your kitty by the window and keep drapes/blinds open for great fall viewing.